THREE DAYS OF ROCKING - FUN IN THE SUN! Sweden Rock Festival gathered over 10 000 rock fanatics to Sölvesborg, Sweden for a three day festival. Great music, great weather and good organising made sure that this was for many a weekend to remember. Sweden Rock started on Thursday when there were a few bands playing on the smaller stages. I had time to look around in the area and look at the arrangements. There were four stages altogether which turned out to be a good solution. The stages were quite close to each other, but far enough so that when there were bands on many stages the sounds from other bands wouldn't bother the crowd in front of the other stages. Vinyl and CD maniacs were treated well as there were many CD-tents where you could find many rare vinyls or CD's. I witnessed a few people flip as they found an album that they had been searching for years. Friday started out warm. The bands were hot but so was the sun. The atmosphere was relaxed and people were enjoying themselves. 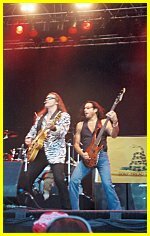 First band that I listened to was Freedom Call who played tight guitar driven rock music and opened well in the Rock Stage. Up next was Dream Evil, a melodic heavy band that I hadn't heard before but who do have good songs and might I add a great drummer Snowy Shaw (Ex-King Diamond, Mercyful Fate, Notre Dame). At the SRF I had a change to listen to their new album "DragonSlayer" and I thought it was one of the best that I've heard in that genre for a while. After Dream Evil I went to check out Doro. She was the first real surprise for me at the festival. She looked absolutely fabulous and the band sounded equally good. The crowd was wild and the first sing-alongs of the festival were heard with "All We Are" and Billy Idol cover "White Wedding". Doro only had an hour reserved for her but I would have gladly heard more. I had a change to have a few words with her and she said that she can't perform with the name Warlock anymore because some former manager had gotten the rights to the logo. She misses the magic and all the things that are related to the Warlock name but there's not a thing she can do about it. A classic case of screwing an artist with legal mambo jambo but that's music business for you. One bad and good part of being in a festival as a reporter is that even though you'll get to do interviews you'll miss the bands that are playing at that time. 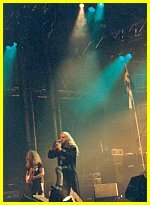 Many people told me that Candlemass were excellent and they also got good reviews in the Swedish press. I couldn't make it to their set, and the same was with Gamma Ray. Another band that surprised me positively on Friday was Status Quo. 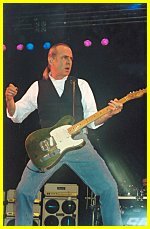 In an interview I did with Francis Rossi he told me that you never know it the show will be good or bad. This must have been one of the better shows, as many fans of a bit heavier music told me that they really liked the show. The Grande Finale for Friday was legendary ex Judas Priest singer Rob Halford. It was loud and proud and the wildest action in the crowd was seen during the Halford show. Friday in general was good and people were really looking forward to Saturday. Unfortunately the burning sun mixed with cool wind had resulted in sun burns and there were some true red skins in the crowd when the day was done. Day three started as hot as the previous one the opener in the main stage was Hanoi Rocks. They started at 13.30 and at that time some people were still walking towards the festival area. Hanoi played quite similar set as they did in Tavastia. The only difference was that there was a lot more room in the stage for the band and especially for the lead singer Michael Monroe and he made full use of it. I'm sure they made some new friends with their energetic performance. I then jumped to a few press conferences and came back for Magnum. They did all of their famous songs and had great support from the crowd. Take my word for it, they are not ready for Rocking Chair for a long time. Then it was time for a bit heavier sounds as Lemmy and Motörhead got on to the stage. There's something about this band that just makes you bang your head. I'm sure there's a lot of routine in their playing but somehow they always sound fresh. Lemmy made a nice gesture by honouring the memory of two of his friends, Joey and Dee Dee Ramone. Ted Nugent's first stop in Scandinavia since I think 1978 was a long awaited event for many. Nugent held the funniest press conference of the SRF and made the reporters laugh both at him and at themselves. He acted very self-confident both in the press conference and on stage. I guess he can afford to, he has a record that speaks for itself. His performance in Sweden Rock Festival was OK. The crowd wasn't wild but it was with him, the sound of the band was perfect and his work with the guitar flawless. I still think it takes more than just good technique to make a good song and I just don't think he has too many of them. Bruce Dickinson was up next and he played a real treat for the HC fans. He said that since he has no album to promote etc. he has no real reason to be there other than to have a good time and to do a great show. The speciality was that they wanted to play a few more unfamiliar songs which they had not played live that much or at all. I would've hoped for more classics but I'm sure the biggest Bruce fans were on cloud nine. I was troubled because Michael Katon was playing at the same time in a nearby stage and I wanted to see him too. I decided to split it in the middle and went to see Michael's latter part of the set. Now Michael Katon is a man who went up a thousand points in my scale during the SRF. I went to see him and I was really sorry to see that quite many had decided to see Bruce Dickinson instead. But the crowd that was listening to him had a ball. There was good interaction with the crowd and everyone was having fun. Katon's slide guitar is just amazing and his music has a sort of rough edge that gives you shivers. I was really sad I couldn't see the whole show but then again I was glad that I captured at least half of it. The last band of the festival was Saxon. And it was an excellent ending to a great festival. They sounded good and they rocked big time. The singer Biff Byford had developed a noticeable gut and I thought he looked a little like Gandalf from the Lord of the Rings. The big difference is that Gandalf sure doesn't rock as well as he did. Hell we're all getting older and if you can do it in front of 10 000 people who dig you then that's just great. The band must've left the stage at least three time at least 3 times and every time Biff came to stage and said: "Hell, we'll do one more". When the show was finally over and it was time to leave I'm sure most of the people were truly happy that they had made the trip to Sölvesborg. In the end it's time to say thanks. Thanks to Elmu in Finland who arranged the trip from Finland to SRF. Thanks also to all the great people I got to know in the bus, especially the Team Finland reporter team, it was great working with you. Last but not least, thanks to the whole SRF team and Tony Balough for arranging such a great festival.